Visit one of the world's largest archaeological sites, the ancient city of Ephesus. See ruins of a city that date back to 10th century BC. See one of the Seven World Wonders of the Ancient World, the Temple of Artemis, in Ephesus. Explore Ancient Turkey! The historic sites are never ending! The country has served as a home to many civilizations including the Greeks, Romans, Byzantines, and Ottomans. Incredible remains of these early civilizations have been uncovered and preserved. See one of the earliest libraries known to exist at Ephesus. Visit one of the ancient seats of the Byzantine Church, the Hagia Sophia. Explore the palace that was once used by Ottoman Sultans. Begin to discover the unique blend of cultures in this ancient land. Travelers will be left in awe after seeing such historic sites! Explore the great ancient site of Asia Minor, Ephesus. Marvel over the ruins of the ancient temples, library, market and spectacular theater. Visit the Virgin Mary’s cottage and the Temple of Diana. Spend time in Pergamum, one a prominent Greek city. The ruins are considered as one of the seven churches of Asia. See Acropolis, embellished with so many beautiful monuments such as the Temple of Trojan and a theater. Go to an ancient Roman medical center, Asklepion. Discover the ancient city of Istanbul, once known as Constantinople. Spend the majority of the time in Istanbul in the historic section of Sultanahmet Square. In the small area of Sultanahmet Square, see the amazing Hagia Sophia and the Blue Mosque. Experience the blend of Byzantine and Ottoman culture. Walk through the Roman Hippodrome that was once used for chariot races. Visit the Topkapi Palace, the main residence of Ottoman Sultans. Make a trip to the seemingly never-ending Grand Bazaar. Wander through the many shops and discover the best of Turkish goods including jewelry, carpets, and ceramics. Upon arrival into Izmir, be met by a local Yampu representative who will transfer the traveler to the Kusadasi hotel. Start the day visiting the great ancient site of Asia Minor, Ephesus with its temples, library, market and spectacular theater. Continue to the Virgin Mary's cottage and the Temple of Diana. Transfer back to the hotel. Drive to Pergamum, visit Acropolis which is embellished with beautiful monuments, Temple of Trojan, and a theater. Visit the ancient Roman Medical center, Asklepion. After the tour, return back to the hotel. At the appropriate time, be met at the hotel to transfer back to the Izmir airport for departing flight. Take a flight from Izmir to Istanbul. Upon arrival into Istanbul, be met by a local Yampu representative who will transfer the traveler to the hotel. Enjoy the rest of the night at leisure. At the appropriate time, be met at the hotel to transfer back to the Istanbul airport for departing flight. The coastal city of Kusadasi is known for its beautiful location on the Aegean Sea and its fun, exciting nightlife. This makes Kusadasi a great city to stay in for travelers wanting plenty of restaurants and nighttime activities to choose from while visiting the ancient sites of Ephesis, Pamukkale, Pergamum, Asklepion, Priene, Miletus, and Didym. Ephesus is one of Turkey’s major attractions. This city is one of the world’s largest archaeological sites. Once home to an ancient Greek then Roman city, Ephesus was thought to have over 250,000 citizens. The site is considered one of the largest and best preserved ancient cities, although only a small percent of it has been unearthed by archaeologists. The ancient city’s main attraction is the Library, thought to be one of the world’s first known libraries. In the heart of Kusadasi with its unique sunset, opposite to the marina, located within walking distance to the city center and within easily reach of Efes Convention Center, Marina Hotel & Suites offers high standards of service with amazing quality of food to our guests. Our primary goal is to create happy and satisfied guests. Our renovated rooms, highly professional and experienced warm hospitality team converts your hotel stay in to a unique experience. Efe Boutique Hotel is located between Guvercinada and the harbor, with view of the unique sea coast of Kusadasi, Modern and stylish rooms with spacious interiors, offers a wonderful atmosphere of living. You will re-discover pleasure of comfortable holiday in our 20-45 sqm standard, deluxe room and studio suite rooms designed by giving priority to the comfort. Our Master Chefs promises you the relaxing pleasure by tasting most elegant examples of Turkish and World cuisine prepared in Sir Winston House. 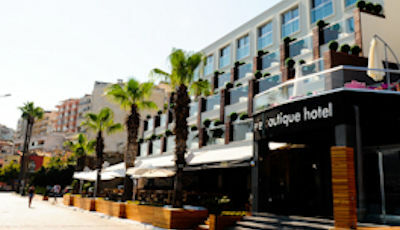 Efe Boutique Hotel is situated on the heart of the city. It is very closed to city center and main attractions within a short walking distance. Its location and private parking allows you to spend wonderful time. In addition, you will feel comfortable in our exclusive private lounge designed for your meetings, birthday parties, and other activities. The most outstanding example of traditional Turkish hospitality and service concepts offered by Efe Boutique Hotel with its fine romance, peaceful and elegant atmosphere of living. Efe Boutique Hotel remains one of the most indispensable of Kusadasi because of its location, comfort and quality of service. We invite you to the Charisma Deluxe Hotel to get you away from the city crowd and ensure you have a peaceful and quality time. You will feel pampered at the Charisma Deluxe Hotel, where you are united with unique blue, comfort and luxury. Located walking distance from the city center, our facility provides a unique accommodation experience for both business and leisure travelers, with an educated staff and quality service. Dilersen is a stylish and comfortable new room with a stunning view of the sea, you can cool off in the blue-flagged Aegean Sea, the newest, most stylish and most comprehensive spa in the region you can find health and away from business. Equipped with state-of-the-art sports equipment and a 450 m² Fitness Center, two large swimming pools, experienced and gentle staff, the Charisma Deluxe Hotel will be an indispensable. When was the last time you and a loved one watched the sunset in serenity all the way? We are trying to remind you the simple tastes of life which we began to forget in the overall Speed and stress of our daily lives. Letting time stand still, escaping to be pampered in a place where the blue of the Aegean and the cobalt sky merge seamlessly into infinity, that’s a luxury not everyone gets to experience. At LaVista Boutique Hotel & Spa, we bring you 280 degree uncut view of the Aegean sea, where you can watch the sun falling into the horizon slowly while you are sipping your gin & tonic, lose yourself in daydreams on our infinity pool, or discover 3,000 years of history of Ephesus. Don’t ask why, just ask when, and let us pamper you here in LaVista. LaVista Boutique Hotel & Spa is the first deluxe boutique hotel of Kusadasi, in our brand new hotel which was built in 2010, we do have 39 rooms 30 Suites with living space and room around 40m2 and our 9 standard rooms around 30m2. All our rooms have balcony and we do have a 180 degree uncut view. You can relax and enjoy from the large menu of different massages.